Another Christmas story translated from G. Lenotre. In this sentimental tale, a band of Revolutionary soldiers fighting the Chouans find themselves overwhelmed by memories of Christmas. This story was told to me one evening beside the Couesnon River near Fougères where from 1793 to 1800 the epic struggle of the Chouans took place. Memories are still keen in these parts of the "great trial" of the Revolutionary era. 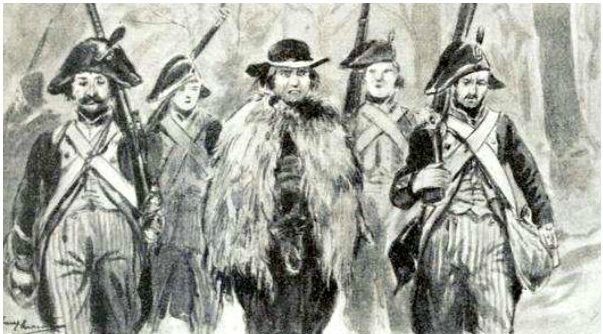 One night in the winter of 1795 a party of Republican soldiers was on the road skirting the forest of Fougères, which connected the routes from Mortain and Avranches. The air was fresh, but almost warm, even though it was one of the longest nights of the year. Here and there, behind bare hedges, patches of snow in the fields caught the light . 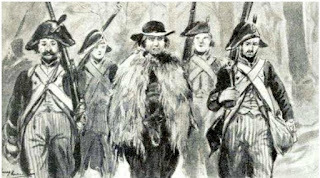 The patriots moved forward: their long hair hung out beneath their bicorne hats; their coats were blue with wide sashes; heavy cartridge pouches banged against their legs; their coarse red-striped trousers were stuffed into gaiters. They went along bent and tired, weighed down by their haversacks and the heavy guns they carried. They led with them a peasant who, earlier that evening, had shot at the band from a hiding place among the gorse bushes. His bullet had gone right through the sergeant's hat then ricocheted back and broke the pipe that one of the soldiers was smoking. They had immediately pursued him, hemmed him in against a bank, then captured and disarmed him. The "Blues" were taking him to Fougerolles where the brigade was camped. The peasant was wearing a goat fleece as a coat, which opened at the front to reveal his Bretonne shirt and a waistcoat with big buttons. He had clogs on his feet and on his head a felt hat with wide brim and ribbons over a woollen bonnet. His hair hung down around his neck. His expression was impassive and hard. As he moved along, his small bright eyes furtively scanned the hedges that bordered the road and the winding pathways that led off it. Two soldiers held the rope that bound his hands, wrapping the ends around their arms. When the Blues and their prisoner had passed Tondrais and forded the river of Le Nanson, they made their way through the forest in order to avoid inhabited areas. At the Servilliers crossroads, the sergeant ordered them to halt. The tired men piled up their guns, threw their bags onto the ground and, piling up dead gorse and leaves, made a fire. Two of them tied the peasant firmly to a tree by the rope around his wrists. The Chouan, with his bright and quick moving eyes, watched the movements of his guards; he did not tremble or say a word; but his expression was full of anguish - evidently he thought that he was about to die. His anxiety was not lost on one of the Blues who tied the ropes. This was a scrawny youth with a mocking and vicious air, wh otaunted the prisoner. "Don't be afraid. Nothing is going to happen to you now; you have at least six hours to live; enough time to win at lotto if you have a good card. There you are, buck up!" "Tie him up well, Pierrot; don't let him take advantage of our politeness." "Don't worry, Sergeant Torquatus", replied Pierrot. "We will taking him safely to the General". "You know, dog", he continued, addressing himself to the peasant, "don't give yourself illusions; the Republic isn't rich and we don't have guillotines; but you will have your comeuppance in lead bullets - six in the head and six in the body. Think on that until morning; that will give you food for thought." With that Pierrot sat down among his comrades by the fire and began tranquilly eating a piece of dried bread from his haversack. This war in Brittany, which had been waged for three years by regular soldiers against bands of peasant, was a bitter struggle against invisible enemies, and had taken on the odious characteristics of a hunt for wild beasts. Neither camp showed the habitual generosity of soldiers; there was no compassion for prisoners, no pity for the defeated; a man who was captured was a dead man. Both the Blues and the Chouans had many men to avenge. It seemed that in this terrible epoch men had lost all sense of humanity; the habit of shedding blood, insecurity about the next day, the overturning of customs, the breakdown of social bonds - these things had made them into beasts, whether brave or treacherous, lions or tigers, having no other goal but to kill or be killed. When he had finished his bread, Pierrot began to load his gun. He chose a bullet and held it delicately between his fingers. "Hey my lad!" he said to the peasant who was following his every movement; "this one is for you". The peasant remained silent and calm before this assault. He seemed to be listening out for some distant sound that the shouts and laughter of the soldiers prevented him from hearing. Suddenly he dropped his head and drew back; from the depths of the forest arose the sound of a bell, clear and distinct in the tranquil night air. Almost immediately a second, lower, bell could be heard from the opposite direction and soon a third, low, plaintive and far away. The Blues, stirred in surprise. "What is that?....Why are they ringing the bells? Is it a signal? Or a warning?" They all spoke at once; some of them ran for their arms. The peasant raised his head and looked at them with his clear eyes. "It is Christmas", he said. "Christmas. They are sounding the bells for Midnight Mass." The soldiers, grumbling, returned to their places around the fire and fell silent. "Christmas", "Midnight Mass"; these words, which they hadn't heard for so long, astonished them. Vague memories came into their minds of happy times, of tenderness and peace; with lowered heads they listened to the bells, which spoke to them all in a forgotten language. Sergeant Torquatus put down his pipe, folded his arms and closed his eyes, with the air of someone savouring a symphony. Then, because he was ashamed of his weakness, he turned to the prisoner and, in a much more gentle tone, asked him, "Are you from these parts?" "I am from Coglès, not far away..."
"And you still have priests amongst you?" "The Blues are not everywhere; they have not got further than the Couesnon and beyond that we are still free. Listen, it is the bell at Parigné which is sounding now; the other, little one, belongs to the chateau of M. du Bois-Guy, and over there is the bell of Montours. If the wind is right, you can hear "la Rusarde", the great bell of Loudéan." "All right, all right; I didn't ask for all the details", interrupted Torquatus, who was disconcerted by the silence that had descended on his men. "What do they call you?" the sergeant suddenly asked the Chouan. "Oh! what sort of name is that?" exclaimed Pierrot, whose mocking laugh was this time without echo. "Silence!" said the sergeant. "You can call yourself what you like. Branche d'or is a war name. I myself have chosen the name Torquatus." The bells still sounded in the distance; and the voice of the sergeant became softer as though he was afraid to break the spell that the music had cast over the sleeping world. "Do you have a wife?" he asked. Branche d'or's lips tightened, his brows covered his eyes and he frowned; he replied with a nod of his head. "And your mother? "asked Pierrot; "Is she still alive?" The Chouan did not reply. "Do you have children? " asked a third man. A sign escaped the prisoner; in the light of the fire they could see tears rolling down his cheeks. The soldiers looked at each other, ashamed. "I am going to untie him a moment, sergeant", said Pierrot, overcome with emotion. Torquatus signaled his agreement; they untied Branche d'or who sat on the ground at the foot of the tree, his head in his hands. "Damn", said the sergeant, "his wife and kids will have a rotten Christmas, when they find out..... What a miserable thing war is!". "In the old days", he continued, "everyone was happy at this time. 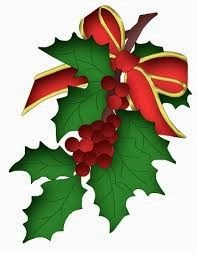 Christmas was a time of celebration and good cheer." "I too have a wife and boys, in Lorraine: it is a land of Christmas trees; they cut down a sapling in the woods and decorate it with lights and toys; how the little ones laugh and clap their hands!" "Where I come from", said another, "they build a great crib in the church with a baby Jesus, and they distribute cakes to the boys and girls on Christmas night"
"In the North, where I am from", said another, "Father Christmas goes through the streets with a long beard and a cloak covered with flour to represent snow. He knocks at the doors and cries out, " Are the children asleep? Everyone is both afraid and happy." The Chouan raised his head, not understanding. "Go! Run away! You are free." "Go!" cried the Blues, "Save yourself...the sergeant has ordered you". Branche d'or got up, shaken, thinking it was some kind of cruel joke. He looked at each soldier in turn, then finally understanding, he gave a cry and raced off into the forest. An few moments later the band of Blues moved on. As they walked off through the forest they suddenly heard a terrible groaning. Torquatus turned. It was Pierrot, overcome with tenderness, crying in great sobs, as he thought about past Christmases, about wooden shoes decorated with toys and about his old mother who, doubtless at that very moment, was praying to the infant Jesus to keep her son safe from harm.